Thanks as always to Greg Fleischer for keeping up with the latest standings. On Saturday March 23rd, MG Club members Ed Rosenquist, Tim and Pat Weeks, Fred and Lisa Whitla and a few family members enjoyed a day out at the Museum of the American G.I. As part of the Museum’s annual Living History Weekend, Saturday’s event was a tribute to World War II. We first met up at the Magnolia Diner for a great breakfast and lively discussion about our cars and military history. We then headed over to the museum about 45 minutes up Highway 6 to College Station, with one MG making the drive. At the event there was much to see, including many operating vehicles such as Willys Jeeps, various military transport vehicles, tanks and motorcycles. There were many men and women in uniform as well as camp setups showing life as a soldier in WWII. Demonstrations were given throughout the day, and rides on a tank or a Huey UH-1 helicopter were offered. The day’s climax was a re-enactment of a WWII battle with all the vehicles participating. All in all, it was a great outing and highly recommended if you get the chance to go. A road-trip to a part of Texas many of us had never experienced… it was a March event that exceeded expectations. The official start was breakfast at the Roadhouse in Tomball. Mike Woodward “borrowed” some routes and ideas from the Texas Triumph Register and refined a plan for our travels over a Friday, Saturday and Sunday. It was about 500 miles total driving and moved us through some very rural territory. Our noon meal was “in the woods” at a place that provided very tasty nourishment. Every entree was $10 but we would have paid that much or more for their scrumptious apple dumplings. Larry Bruce Gardens is near Kennard and a dining establishment really worth the trip. By late afternoon, we arrived in Nacogdoches for a final stop at Toyland. In reality, it is a small warehouse full of toys from the ’50s and ’60s. Owner Randy Legler says, “I buy old toys and pedal cars.” As the photos attest, Randy has thousands of old toys that bring back childhood memories for most of us. It must be one of the largest collections of its type in the U.S.
Nacogdoches claims to be the “first town in Texas.” (There is evidence of Indians living there about 10,000 years ago.) The city of 33,000, home of Stephan F. Austin State University, has done a great job in preserving the past and providing a very comfortable small-town getaway with lots of history. As the sun set, we walked to a fine restaurant for a well-arranged group dinner. The bar back at the hotel provided beverages for easy sleep. After breakfast on Saturday we traveled 65 miles back to Palestine in search of the Texas State Railroad. As we pulled into the parking lot we heard, “All Aboard!” With minutes to spare we found our assigned passenger “luxury car” for travel to Rusk, Texas, an hour and a half to our east. It was a comfortable Piney Woods journey, with lots of distractions on a mostly sunny day. In Rusk we enjoyed a pleasant picnic lunch by the lake as the ’50s era locomotive prepared for the return trip to Palestine. The road trip back to our hotel included many rolling, twisty country roads. On a previous driving event, Gordon and Angie Bard tangled with a deer. We all observed that it rearranged the front of the 1972 blue MGB a bit. As you could almost predict on this trip, another deer was dancing at the side of the road as it timed its crossing over. After Gordon came to an abrupt STOP, the deer bolted across the narrow roadway. “Hit me once, shame on you. Hit me twice, shame on me.” We watched it happen from behind but could not get a camera up in time for a picture. We are glad that no British metal or deer hide was damaged this time. Back in the oldest town in Texas, we enjoyed a little time at a local brewery, a block from the hotel, along with other St. Patrick’s Day patrons. Then it was another short walk to a restaurant for fine Italian cuisine. With a leisurely start in the morning and a 10am rollout, we traveled west to our lunch spot, Jerry’s Cafe in Onalaska. There, Shy Quiet Gordon, reconnected not with a deer, but a dear, that he got know while securing vintage motorcycle parts some years ago. Ahhh… small-town Texas. Stuffed again, we all headed back to the Big City using a variety of routes dictated by exact final destinations. Once again we observed that overnight Club events are not only fun but most effective in promoting closer friendships among participants. We welcomed brand new members Peter and Maria Ferrer who were compelled to drive along in their late model Jaguar. Others who will recall the enjoyment of this LBC trip for years ahead are: Gordon and Angie Bard, Walter and Leona Bernard, John and Cindy Blum, Dwight and Candy Dawson, Greg Fleischer, Bob and Kathy Schroeder, and Mike and Stephanie Woodward. As participants who had no choice but to drive “a lesser car,” we can encourage that you tag along on these trips without an MG if you must. It will be well worth some embarrassment and minor harassment. 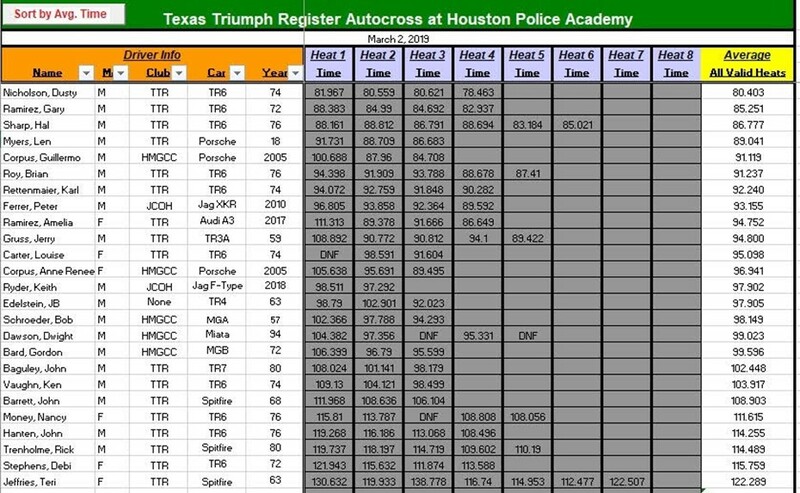 So what is an autocross? Several of us found a unique answer to that in an early March event organized by the Texas Triumph Register. Invited to play along were the Jaguar Club and the Houston MG Club. On the Houston Police Academy grounds in far northeast Houston, a challenging .81 mile course with 43 ‘gates’ was created by event planners. The diagram here was provided to participants. To keep frequent drivers sharp, the exact course is modified each time the event is offered. A slow drive-through with an event volunteer was the first exposure to the track for most of us. 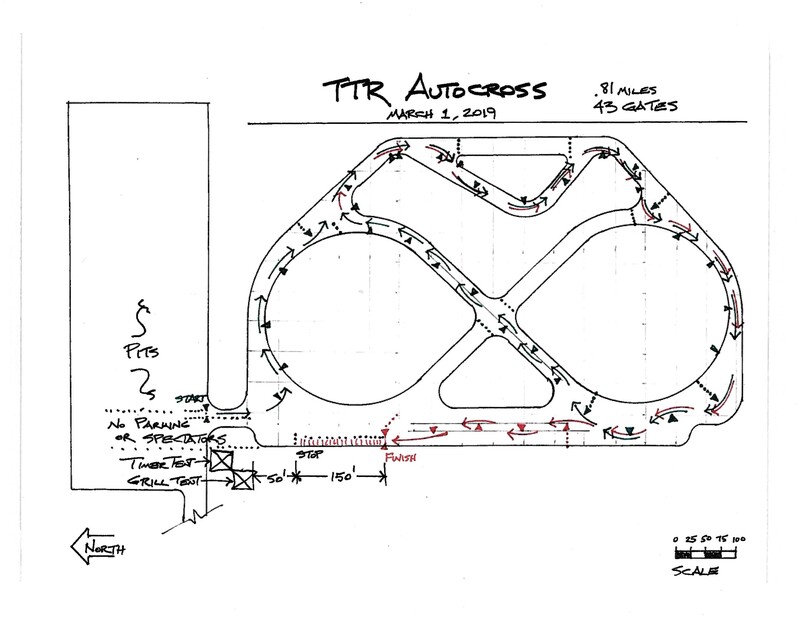 “A sharp turn is required here…a slowdown is recommended at this corner to avoid drifting into the mud…on the first lap you must turn RIGHT, and then turn LEFT on the second round to begin the slalom to the end alley.” This prompted us to study the diagram more carefully before the first official run. The experts told us to make the initial run deliberately slower and focus on the route. But once on the course, it was difficult to hold back. Run the best line and hug the pylons and press for speed… or some-such strategy. With top speeds varying greatly between 20 and 35 mph, many cars were only in 2nd gear or maybe 3rd. Screeching tires around the pylons and full acceleration exhaust notes were common. Some mud was observed on the sides of racers. A few total spinouts drew “oooohhh”s from the pits. The elapsed time of each run was recorded via electronic timers at the Start and Finish, and the number of runs limited only by waiting your turn behind other racers. Only one car was on the course at any given time. With the run-time being so brief, your turn came around quickly. The truly most difficult part of the event may have been putting on and taking off the required helmet that was borrowed from a supply at the Start line (or maybe mine was just too small). A time of 80 seconds means an average speed of 36.4 mph. On course, it seems much faster. The greatest fun was going all out through the slalom segments. I hit one pylon soundly, which scuffed up the right front wing a bit. (Involuntary curse.) A fun surprise, when the day was done in my convertible, was finding bits of road-rubber debris (‘marbles’) spread upon the passenger seat. That had to be evidence of real RACING! Who is that in the MGB wanna-a-be, it couldn't be Dwight, or could it? In attendance from HMGCC were Greg Fleischer, Bob and Kathy Schroeder, Gordon Bard, Ray Holtzapple, Dwight Dawson and former member Keith Ryder. 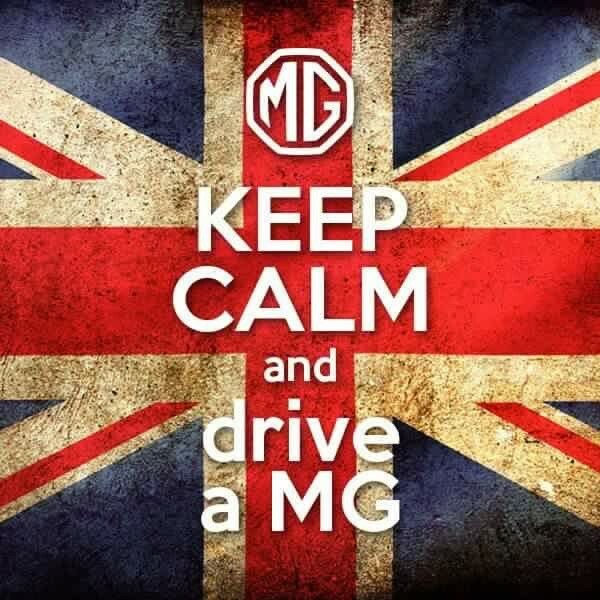 Running the autocross is a MUST-DO for all MG drivers. There is no better way to enjoy and really understand your LBC. Should anyone need plans on how to construct this “hanging shelf” please pop me an email at mike.woodward@sbcglobal.net. 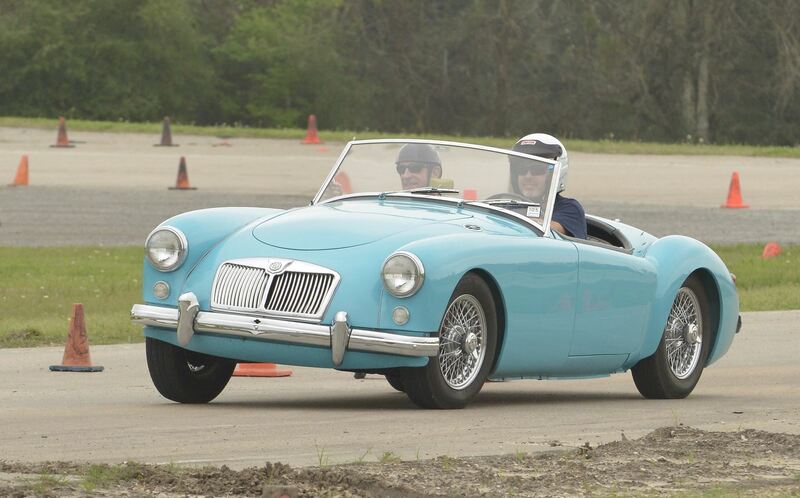 Note from the Houston MG Car Club: If you have a tech tip that you think would be a benefit to your fellow club members, please submit it to houstonmgcarclub@gmail.com. We will publish it in the ROARS giving you attribution. Photos are always helpful but not required. However getting power from the maintainer to the battery usually involves connecting those pesky alligator clips to the battery posts, which if it is like my MGB LE, is under the back parcel shelf and seemingly next to impossible to get to. If you are in any doubt as to how to perform these modifications please contact your local auto electrician for advice. Your Houston MG Car Club has clarified and changed the annual awards for the Club and annual Car Show. The intent of these changes is to clarify eligibility requirements and provide a guideline on what awards are available and who is eligible to participate. All Club awards are presented at the annual Christmas Party. 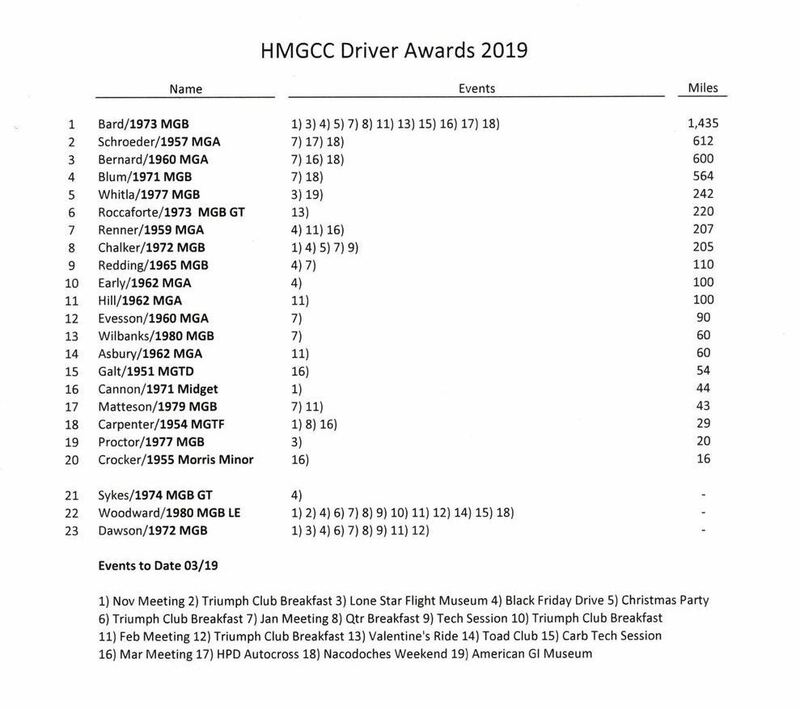 Driver’s Award: Awarded to the member with the most round trip miles (points) driven in an MG to a sponsored Club event. 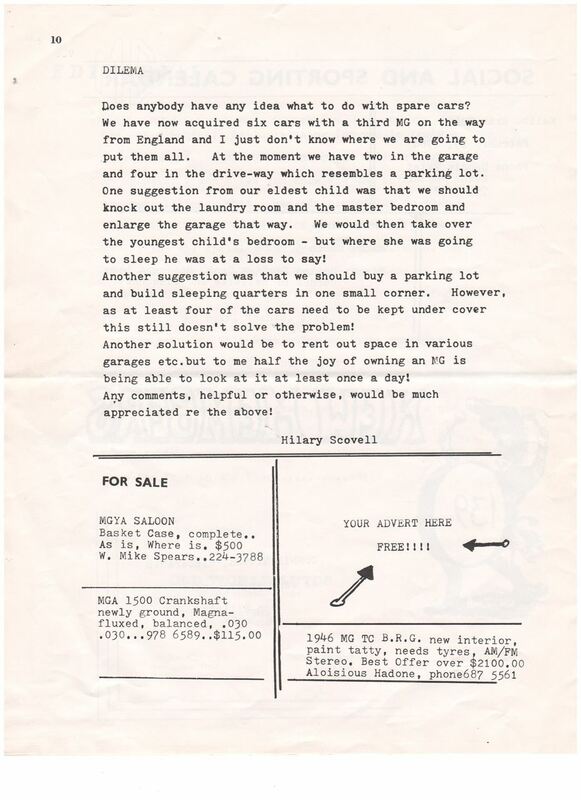 If no MG is owned by a member, miles (points) may be accumulated by driving another vintage (1980 and older) British marque vehicle. Timeline is November 1st through October 31st. Alan Rayne Memorial Traveling Trophy (aka “Broken Crankshaft”): Humorously recognizes a Club member who incurs mechanical or other MG car breakdown issues to/from an official Club event. Board of Directors’ Award: At the discretion of the Board, given to any Club member who provided exceptional leadership or service to the Board during the previous year. Attending multiple events during the year. Presidential Recognition Award: Recognizes a successful term as President of the HMGCC. Given out every two years. As most members are aware, our Club hosts an “All British” Car Show in the fall of each year. This show is open to all British marque vehicles and is open to the public. A long-standing tradition for our Club, 2019 will mark the 30th annual event sponsored by our Club! The show this year will be held on Saturday, September 21st, 2019 and will be held in The Woodlands area for the first time in our Club history. Individual Class Awards: First, second & third class awards (depending on the number of vehicles registered). Voting is conducted by all registered participants. Best in Show Award: Recognizes the vehicle that appeals most to registered participants. Voting is conducted by all registered participants. 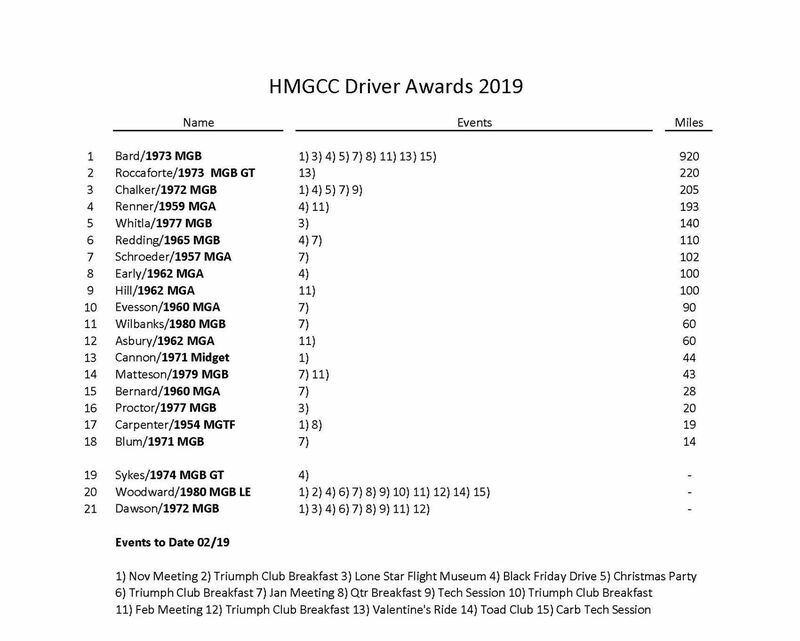 Ralph Diebert Award: Award for the most popular MG marque vehicle whose owner is a current member of the HMGCC. Voting is conducted by all registered participants. People’s Choice Award (new): Award for the British marque vehicle that appeals most to spectators and the general public, all of whom are eligible to vote. Additional details for the Club and Car Show awards can be found in the “ABOUT” section of our website: www.houstonmgcc.com. Thanks and please reach out to any Board Member or Club Leadership if you have any questions.